Apple files a lot of patents, there’s no question about it. Moreover, it’s not necessary that the envisioned products will see daylight any time soon. Nonetheless, there could be many reasons for the company to file a patent. 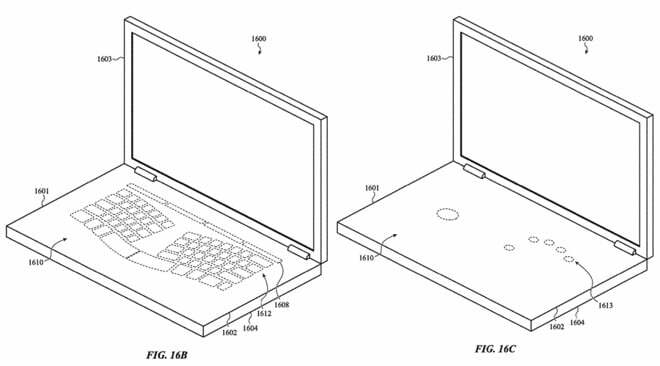 Now, a trio of new patents has emerged which envisions the MacBook with a virtual keyboard and an invisible trackpad. So let’s dive in to see some more details on the new Apple patent and how Apple deems to achieve it. Basically what Apple envisions will turn the whole area under the keyboard into a trackpad. In addition to this, Apple also describes a MacBook which will not feature a mechanical keyboard. Instead, the patent suggests that the notebook will feature a transparent top made from plastic or glass and there will be several sensors housed underneath. The added sensors will be responsible for detecting where and when a user’s finger has touched and the amount of level of pressure applied. A portable computer includes a display portion comprising a display, a base portion pivotally coupled to the display portion and including a glass top case. The glass top case defines an exterior surface and a keyboard opening through the glass top case from the exterior surface to an interior surface. The portable computer further includes a keyboard positioned at least partially within the keyboard opening and comprising a substrate, a key configured to move relative to the substrate, and a fabric cover disposed over the key and defining a user interface surface of the key. Furthermore, there’s a possibility that the transparent top could also support a display underneath which can be used for illumination or to add glyphs to the keys. In addition to this, thanks to the display under the transparent top, the keyboard can also show alternative buttons depending on the application that you’re in. The keys can also be used for gesture-based controls similar to the ones on a Magic Trackpad or the Magic Mouse. 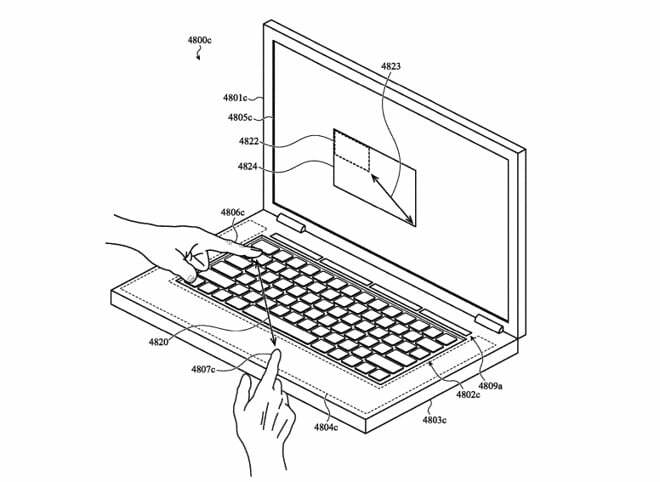 This is not the first time that an Apple patent with a virtual keyboard appeared. Previously, there have been various others, highlighting the extinction of physical keys on a laptop. Would you want to use a virtual keyboard over the physical one? There will be more to the story, so be sure to stay tuned in for more details. This is all for now, folks. What are your thoughts on the new Apple patent? Let us know in the comments section below.